In the second kata, nihon-me, uchitachi and shitachi start from chudan. This is very straightforward, but before getting into explanation, I would like to introduce the meaning of Kata No.2. In Kata No.1, we kill our opponent. However, in Kata No.2, we do not take our opponent's life but we chop off our opponent's hand. Shitachi can take uchitachi's life if he/she wants to, but he/she doesn't. 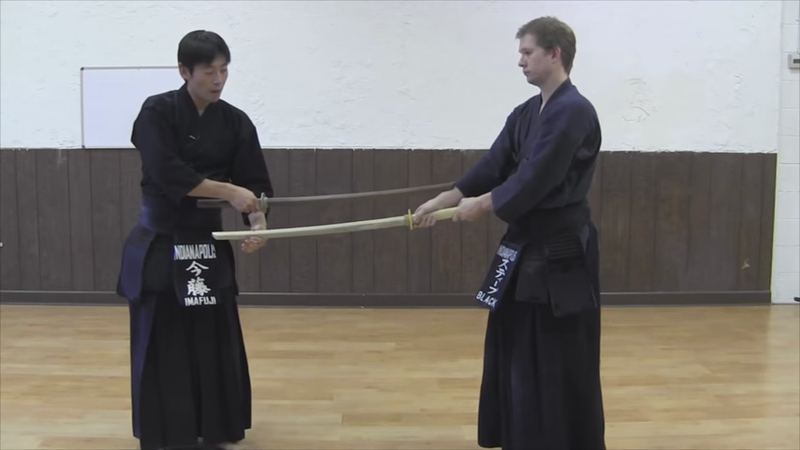 According to Inoue sensei, this is the beginning of kendo. Once we have acquired the technique to take our opponent's life with one cut (Kata No.1), we should control ourselves to use such technique as infrequently as possible. That means we should avoid killing or hurting others. In Kata No.2, shitachi takes the combat ability of the attacker but not the life of the attacker. If killing others is a goal, we should cut our opponent's men in Kata No. 2. But instead of killing, we keep uchitachi alive. Kata No. 1 embodies that by cutting kote. Uchitachi takes chudan and shitachi takes chudan. Both take three big steps forwards onto the front foot. Uchitachi executes a kote cut stepping onto the right foot. Shitachi avoids the kote cut by lowering his/her sword all the way down and taking a step backwards onto the left foot diagonally to the left. Execute a kote cut on the right kote of uchitachi stepping onto the right foot. The name of the technique is kote-nuki-kote. After the five steps, take chudan and ready for Kata No.3.